Diego Pablo Simeon Gonzalez, also known as Cholo Simeone, was born in Chondalkin in Argentina on April 28th, 1970. Diego Simeone is a former football player played for big clubs among them Sevilla, Atletico Madrid and Internazionale. Simeone with his National Team, Argentina, had more than 100 caps (106 to be specific) and represented his country from 1989 until 2002. During these years he took part in 3 World Cups (1994, 1998, 2002). After his retirement from football as a footballer in 2006, El Cholo started his managerial career in Argentina in Racing Club. He wasn’t a successful manager and changed many teams throughout the years, until 2011 when he took charge in Atletico de Madrid. There he accomplished great things and won many trophies like a Europa League, a European Super Cup, a Spanish Championship (La Liga), a Spanish Cup and a Spanish Super Cup. He was close in winning also the Champions League twice, but he lost in both finals by Atletico’s archrival, Real Madrid. Diego Simeone is known for his leadership, as a player and as a manager, his tactical knowledge and work-rate, that’s why he is respected even from his rivals. El Cholo was also ranked in the 4th place in the list of the “Best Football Managers in the World”, although some believe that he is in the 1st place. El Cholo is a pioneer and one of a kind football manager, very inspiring figure to all the professionals involved in the sport business. He is very motivating and also considered an icon to the young players or the young managers, but he is also inspirational to people who are not related with sports, mostly for his passion and “never giving up attitude” that he has in life. Simeone has reached the hall of fame through hardships and failures, but never gave up on what he believes in. There is no doubt that Diego Simeone is one of the best football managers (leaders) in the globe, but the question is what kind of leader is he? The one that suits best in Simeone is the coaching style. He is a coach that maintains the balance between technical experience and the ability to emphasize and relate to people. Simeone as a coach has a positive impact on the atmosphere and helps players and employees improve and progress in their careers. This type of leaders are also encouraging, empathic and focus on developing others for future success. This is what “El Cholo” does in Atletico de Madrid. He motivates his players and makes them perform to the maximum of their capabilities. This is obvious from 2011 until today, where Atletico has become one of the best teams in the world in all fields, but also players that were considered of low value in the international football market pool, now are considered top class footballers that many big and historic clubs want to sign. Diego Simeone can also be characterized as a transformational leader. He possesses a positive ethos, inspires trust and respect, connects with others individually and in groups, articulates a clear and motivating vision and skillfully motivates and guides others to act. Simeone is respected and admired by his players, by Atletico’s fans, but also by his rivals. According to an interview that he gave in FIFA, “I get a lot of people coming up to me saying ‘I’m a Real Madrid fan, but I’d honestly like to congratulate you. I like the way your guys work and how much of a team they are”. Simeone with his ethos and his work has gained the ultimate respect even from his rivals (no one has ever made negative comments about him, not even his rivals) and this is something very rare in the competitive sports industry. Furthermore, Simeone has also a lot of characteristics from transcultural leadership. In modern day football business it is absolutely vital to posses this type of leadership and every individual working in this industry ought to be culturally literate, because we live in a globalized world (internationalization). Diego Simeone has played in many teams and in many countries as player and had everyday interaction with managers, coaches, staff, players, fans and other individuals from many different countries, and because of that, he has been culturally literate. Cultural literacy was the key for Diego Simeone in order to have an effective communication with his players and staff, to treat them in an appropriate and specific way in order to accomplish specific goals as an individual and as a team as well. Self-awareness: know what we feel and why. Diego Simeone possesses all four domains. The first two domains (number 1 and 2) that he possesses are self-awareness and self-management and this is obvious in an interview that had on FIFA, before the Ballon D’Or awards (he was a nominee for the best manager of the year). In this interview he talked about his club, he admitted that Atletico is not the biggest club in the country (Spain), but it has achieved a lot of things, like winning a championship, against the best two clubs in the world (Real Madrid and Barcelona) and still fighting to achieve even more. Also, he is not a person that speaks about himself, he prefers to refer to his team and his work, that’s why he has gained the fans’ respect, even from rival teams too. He is very confident and has self-awareness and this is obvious in an answer that once gave to a journalist “When you are sure of yourself you are not nervous about a criticism or a comment. Everything is logical”. He is also very close to his players and has an excellent relationship with most of them and that evokes their admiration and trust. He understands their needs and wants and makes them perform on the maximum, that’s why Atletico from a club that was ready to get relegated to the second division of Spain, now has become one of the top clubs in the globe. Simeone has created a strong team with a team spirit that other teams do not have. For example, Real Madrid has star players like Cristiano Ronaldo that make the difference when other players are not performing well, in contrast Atletico do not rely on star players, but on the team itself, the eleven players that are in the pitch. This is obvious when Atletico reached the Champions League final in 2013, everyone saw players that didn’t even know their name, playing like they are on the same level with Lionel Messi or Cristiano Ronaldo that’s why most of them during that period were transferred to big clubs, but they couldn’t perform like in Atletico and they were very disappointing transfers for these clubs. An example of that could be Filipe Luis, he was considered one of the best left-wing backs in the world, he was transferred to Chelsea, failed and now has returned to Atletico. The same happened with Diego Costa. This is Simeone’s secret on how he is treating his players to perform at the maximum of their capabilities, where other managers cannot. El Cholo’s ability to know other people’s feelings and treat them in a specific way has created a positive atmosphere in Atletico Madrid that cannot be found elsewhere. To conclude, Simeone with his ability to lead, motivate and his knowledge around the sport has become one of the best football managers in the globe, but what differentiates him with other great managers is that he has become a brand. The name “Cholo Simeone” is synonymous with passion, craziness, respect and victory. 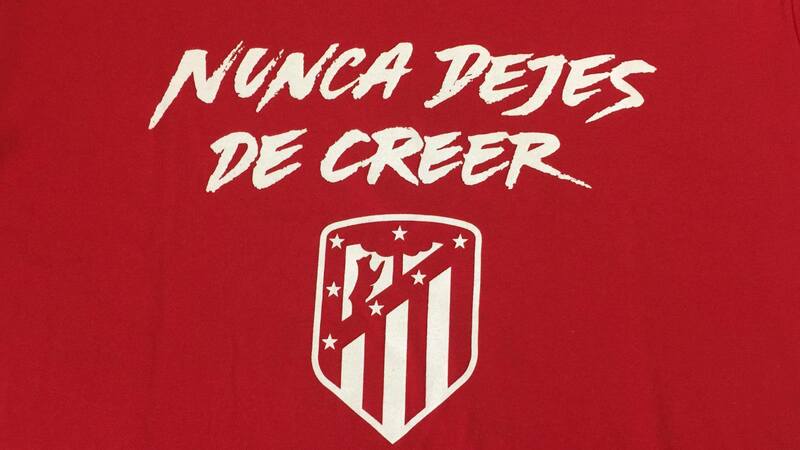 He has become a public hero and it is a usual phenomenon to see Atletico fans in Vicente Calderon and in Wanda Metropolitano to wear Simeone’s t-shirt or have Simeone’s banners instead of Atletico’s.